One of the great myths in the religion of American literature celebrates the twisted wisdom of the alcoholic writer—the brazen artist who finds narrative meaning by washing his brain with a boozy elixir of unvarnished truth. There’s the unholy trinity of Faulkner, Fitzgerald, and Hemingway, followed by lesser saints like Jack London, Malcolm Lowry, and Charles Jackson, whose The Lost Weekend helped establish this legend on the drunken page and the silver screen. Jack Nicholson’s character in The Shining, Stanley Kubrick’s adaptation of the Stephen King novel, also comes to mind. King would later reveal that he was nearing the bottom of his cocaine addiction when he was writing that book, stuffing toilet paper in his bleeding nostrils as he battered out page after page. Then there’s the journalistic cult of the drinking press, a tradition that includes the hard-boiled hacks of The Front Page and the heroic journey of Hunter S. Thompson, who greatly expanded the pharmacology of the intoxicated canon before (like Hemingway) literally blowing his brains out. 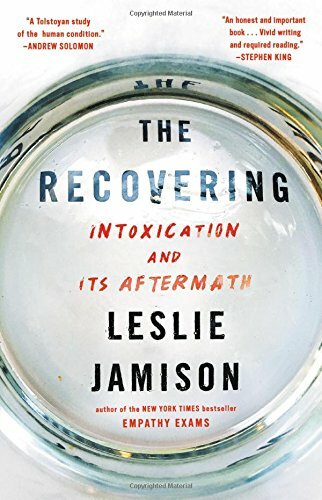 Notice that all the characters in this hagiography of hooch are men—something Leslie Jamison rightly protests in her impressive new work, The Recovering: Intoxication and Its Aftermath. Her tour-de-force through this literary tradition is interspersed with her own long, sordid and shameful tale of alcohol addiction, sexual promiscuity, romantic insecurity, and ultimately, her search for sobriety via the rooms of Alcoholics Anonymous. Jamison, whose previous works are an essay collection called The Empathy Exams and a novel titled The Gin Closet, sometimes loses her focus in this ambitious attempt to say all and everything about the literature, personal toll, and politics of addiction. Her seemingly endless account of her relationship with a guy named Dave seems a bit obsessive in real life and on the page. Most refreshing is her retelling the story of drunken artists who also happened to be women—such as the novelist Jean Rhys and the blues singer Billie Holiday. Jamison writes about how alcoholic women artists don’t get the heroic portrayal of their male counterparts, especially if they also happen to be black. They are seen as pitiful creatures who abandoned their children and/or dangerous criminals who need to be locked up. Writers or others who’ve thought about telling the story of their own struggle with substance abuse may laugh when Jamison confesses how she googled \the phrase “just another addiction memoir.” It produces pages of results, mostly from writers, publicists and critics arguing that a certain book is not just another addiction memoir. The Recovering is certainly not just that. It is a unique blend of literary criticism and personal exploration, required reading for writers or other people interested in how mind-altering substances can both fuel and subvert the creative process. Don Lattin's most recent book is Changing Our Minds: Psychedelic Sacrements and the New Psychotherapy. He is an award-winning journalist. His journalitic work has appeared in dozens of of U.S. magazines and newspapers.